Talented chocolatiers at Bournville’s Cadbury World have been busy giving their popular chocolate Buckingham Palace creation a happy and glorious makeover ahead of The Queen’s official birthday celebrations this Sunday 12th June. Two chocolatiers have spent three days creating all the necessities for a right royal celebration. Complete with Union Jack bunting, a picnic basket, balloons, tea sets, sandwiches, cake, flowers, trees and a striped lawn all made entirely from chocolate, Cadbury World’s latest creation is a chocoholic’s dream street party. The creation also features crowds cheering ‘Long live our gracious queen!’ and a draped red balcony for The Queen to watch over the celebrations. 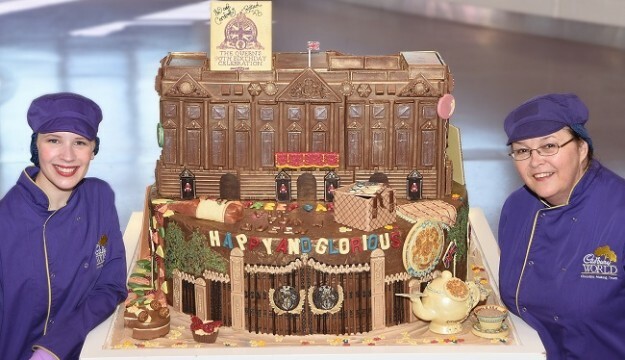 Back in April, the Cadbury World chocolatiers delicately constructed Buckingham Palace from chocolate to mark The Queen turning 90 years old. Complete with ornate gates and its own chocolate soldiers standing guard, the show-stopping palace was one of the chocolatiers’ most impressive creations yet. Weighing almost 60kg and standing 70cm tall, the iconic building was finished with an edible gold and silver lustre and the intricate British royal coat of arms piped by hand. The creation has had a fresh makeover to coincide with the highly anticipated Patron’s Lunch this weekend, which will see The Mall in St James’s Park transformed for its largest ever street party to celebrate The Queen’s patronage of over 600 charities and organisations on the occasion of her 90th birthday. Diane Mitchell, marketing manager at Cadbury World, said: “The original version of the palace was extremely popular with visitors and it’s easy to see why. But the chocolatiers weren’t quite finished, and wanted to celebrate The Queen’s street party the best way we know how – a chocolate masterpiece! This latest indulgent masterpiece follows on from previous regal creations including a chocolate cot equipped with toys made for Prince George’s birth in 2013 and a 12kg chocolate pram made last year marking the birth of Princess Charlotte. 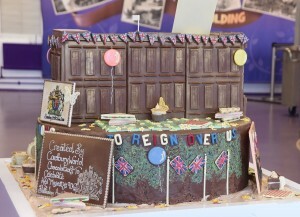 The Buckingham Palace street party creation will be on display at the popular Chocolate Making zone at Cadbury World.